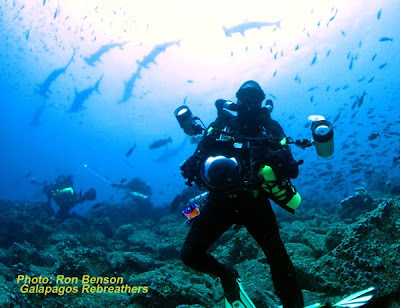 Following the success of our first comprehensive rebreather trip to the Galapagos in 2013, we are now organizing the next bi-annual trip for September 2015. 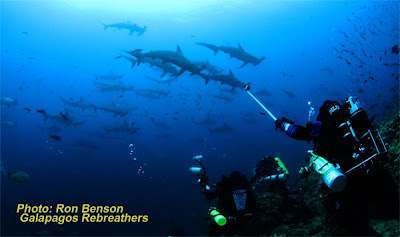 These trips represent the pinnacle in aquatic interaction on closed circuit rebreathers in the Galapagos and offer unique encounters unavailable on open circuit scuba. This amazing experience is now made available to a very limited and select group of divers. The Galapagos archipelago is a world famous hotspot for observing marine mega fauna, especially sharks. The use of rebreather technologies provides great opportunity for very close wildlife experiences in the islands. This is a reason why many diving enthusiasts and underwater imaging specialists come every year. But very few of the regular tourists will ever have the opportunity to witness this world patrimony national park in its perfect silence. If the experience is amazing enough in Open Circuit imagine it with the bubble less and quiet and moist environment a rebreather provides. 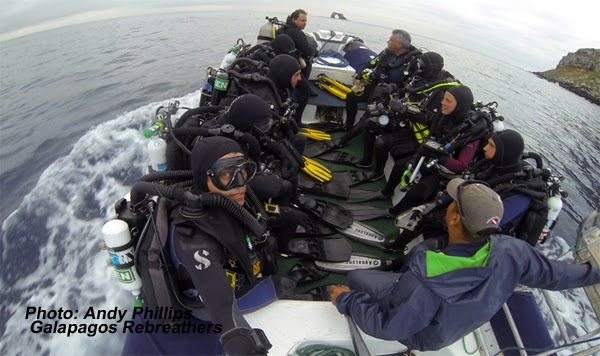 From September 7th to 14th, 2015 a rebreather oriented expedition to the Galapagos Islands is being organized by PADI Course Directors and Technical Instructor Trainers Andy Phillips and Jorge Mahauad. The specialized trip is supported by Galapagos Rebreathers. Following the success of our 2013 trip and guests wishing to rebook we only have 9 places available as of January 2014. Please contact us for more information.